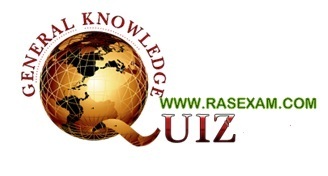 QUIZ 10: Sample RAS Paper Questions from India GK, Science Question for RAS/RTS Examination. RAS Exam normally have 50 Questions from India, World GK and Science Questions. Here is Sample Question paper with Selected Questions covering all these topics. 2. Who discovered first that Sun is center of Solar System and earth rotate around run. A. Place where bandits resides. D. Place for peace and meditation in Asia. in 11 question durand cup is also related with football....and santosh trophy too...then what is d right answer? @ Sandeep.. Thanks for correction...Santosh Trophy and Durand cup was related to Football..Now its corrected by Durand cup..Which belongs to Tennis.. The borrower can repay the loan amount in a term of six months to 10 years http://crcm.tv/5v the best thing to accomplish would be to collect these documents and compare their charges.